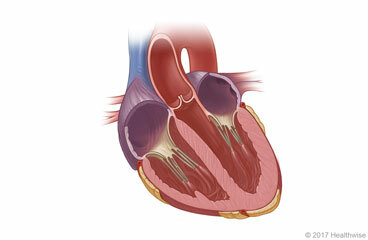 Heart defect repair is surgery to fix a heart problem that prevents blood from flowing normally through the heart. You can expect the cut (incision) in your chest to be sore for a few weeks. The doctor will take the stitches out of your incision about 1 to 3 weeks after surgery. You will probably feel more tired than usual for several weeks after surgery. You may be able to do many of your usual activities after 4 to 6 weeks. But you will probably need 2 to 3 months to fully recover. Some people find that they feel sad or more emotional while they are recovering after this surgery. This may last for up to 6 weeks after surgery. Talk with your doctor if your sadness continues or you have concerns about how you are feeling. Treatment and other support can help you feel better. For 3 months, avoid lifting anything that would make you strain. This may include a child, heavy grocery bags and milk containers, a heavy briefcase or backpack, cat litter or dog food bags, or a vacuum cleaner. Hold a pillow over your incision when you cough or take deep breaths. This will support your chest and decrease your pain. You will probably need to take at least 4 to 6 weeks off from work, depending on your job. If your job requires heavy labour, you may need to take as much as 3 months off. You may not feel as hungry as usual. Or food may not taste as good as it usually does. This is common and usually gets better about 4 weeks after surgery. If you do not feel like eating, you may want to drink liquid meal replacements for extra calories and protein. This can help you keep up your strength and prevent weight loss. If you take a blood thinner, be sure to get instructions about how to take this medicine safely. Blood thinners can cause serious bleeding problems. Enter X878 in the search box to learn more about "Heart Defect Repair: What to Expect at Home".